Poor Kenzo is in a dire state through no fault of her own. She is hardly more than a pup and has had no training, she gets no exercise, she is locked in a utility room in the house, is left for up to twelve hours daily and is never walked. Naturally she is going 'off her head'. Our assessor described her as a 'coiled spring'. This poor girl is a victim of circumstance and the economic decline in the country. Her owner lost her job due to cutbacks and has had to commit herself to further training in order to get another job. Kenzo was a young pup, when this catastrophe occurred, and so was not given the time and training that a pup needs at each stage. She was the real victim of the family crisis. The result? She is a bouncy seven week old pup, as regards training, in the body of a nearly fully grown GSD. There does not appear to be any malice in Kenzo. She let our assessor handle her without demur and remains apparently sane and friendly. It is amazing that she has not bitten anyone out of sheer frustration. She is shut in the utility room all the time because she is bouncy and she does not even enjoy the full run of the house or garden. She has had no training, no exercise, little attention, and no life that a young dog like her deserves. 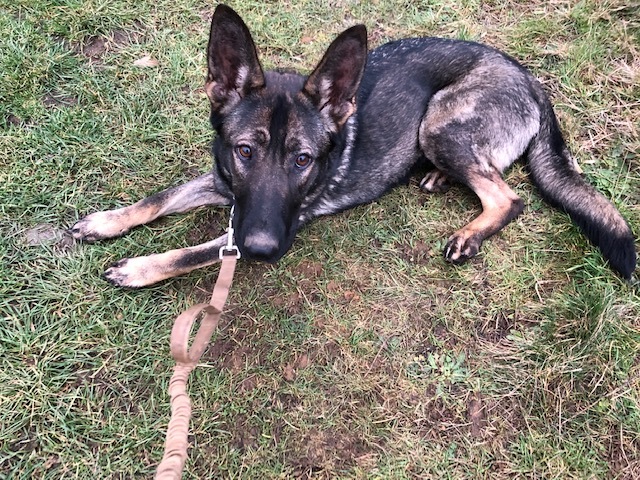 It was hardly possible to walk her even, and she will need an owner confident in establishing leadership with a strong, active, untrained young dog. We would want to rehome Kenzo to a home with older children who would not be intimidated by her bounciness. 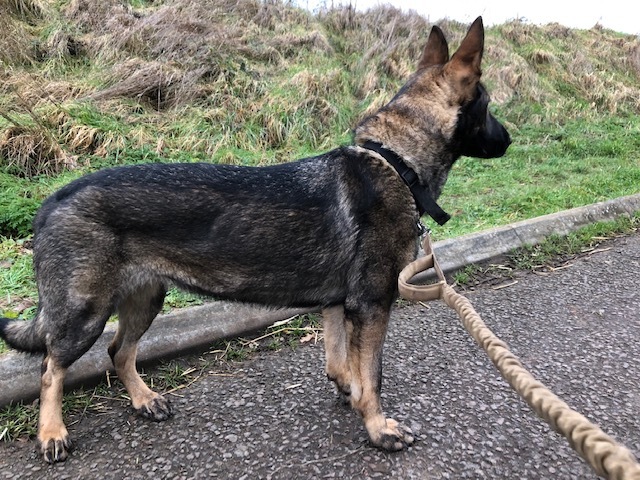 Her prospective adopter would need to be an experience GSD owner, even though introducing Kenzo to the basics of training would not be much of a challenge in our opinion. Once this girl had the chance to run in a garden and she is able to get rid of her pent up energy with a routine of regular exercise, her training should be relatively easy to establish. She is a bouncy strong girl so it would be a help for her adopter to be physically up to the challenge that she will present, at least initially. Once established in a new regime, we are confident that this sweet girl will be a credit to the breed. Kenzo has been in foster care for several weeks now and is a transformed pup. She has calmed down, thanks to change in diet and routine. She now knows the basics of training and plays happily by herself with a kong. She would love a family with children who would like to play with her. This pup is a now a sweet well behaved girl who has the makings of an exceptionally devoted and responsive family addition.